I’ve never posted about my time as a Cameron Crazie. I’ve been about as die-hard a fan as you can be over the past four years. I’ve never missed a home game while I’ve been on campus. I’ve been a top-10 tent for the Duke-UNC game every year. I’ve been front row, painted and cheering maniacally for almost every ACC game. Duke basketball has been one of the main focal points of my time here and tonight is my final game as a Cameron Crazie. Of course, I will always be one at heart, but my time in the student section is up. Time to pass the baton. Maybe at some point I’ll reflect on my experience in the Cameron student section. It’s a lot more than cheers, jeers and a sea of blue and white. It’s an intricate process, complete with long schedule-making, rushed pregame painting and cold nights on the sidewalk. Of course, it is well worth it. There’s no better view in college basketball than the one I’ve had the past four years. Every second was worth it. Here’s a picture from right before the Duke-UNC game my freshman year. 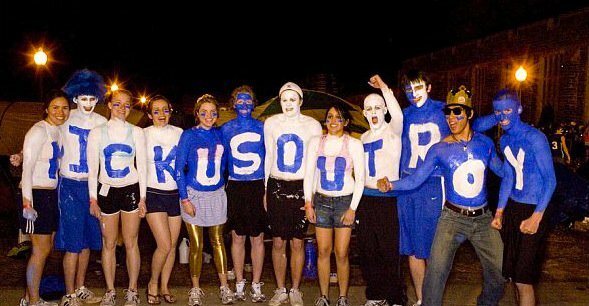 We spelled out “Kick Us Out Roy” after UNC coach Roy Williams had security remove a fan from a UNC home game after he yelled during a UNC free throw, something that happens everywhere all the time. I’m the awkward “I” in blue hair, second from the left. It’s also fitting that my penultimate game was possibly the best one I’ve been to. Duke-UNC games have been incredible over the years, but this past weekend’s Duke-Miami showdown was as good as those. It was as loud a crowd as we’ve had in a long time and few players have had as special a night as Ryan Kelly. Add in beating a top-5 team and a close, well-played game and it made it an unbelievable night. I’m glad it was the penultimate. Tonight we play Virginia Tech (the last-placed team in the ACC) and hopefully will win easily. Hopefully Coach K can give big minutes to walk-on senior Todd Zafirovski and take senior stars Seth Curry, Ryan Kelly and Mason Plumlee off to a long standing ovations. They deserve it. If tonight’s game was against Miami or an equally tough opponent, we would be too caught up in the game to thank the seniors. Playing against Virginia Tech provides us that opportunity. So tune in to ESPNU at 7 tonight and watch the seniors’ final game. I’ll be in the front row painted (weather-permitting, right now not looking good).